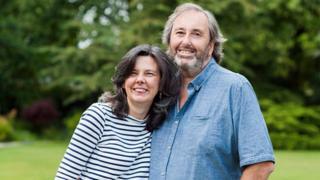 The man who murdered children's author Helen Bailey for her multi-million pound fortune has been ordered to pay almost £100,000 in legal costs. Ian Stewart, 56, drugged and suffocated his fiancée before dumping her body in a cesspit under the garage of their Hertfordshire home. He denied murder but was found guilty by a jury and jailed for life. Stewart did not attend the costs hearing at St Albans Crown Court because he was "too ill". The court was provided with a note from a nurse at Bedford Prison confirming his illness. Judge Andrew Bright QC ordered that Stewart pay the £98,455 prosecution costs in his case. It included fees for barristers, expert witnesses and live links for witnesses to the US and Newcastle. The judge said: "I appreciate he is not here. I have a medical document. I will leave [the] door open if he has a quarrel to pick with figures." He said Stewart, who lived with Ms Bailey in Royston, had 14 days to appeal against his ruling. Prosecutor Stuart Trimmer QC said the cash to pay the costs was available from a number of Stewart's bank accounts that had been frozen. During the trial, the prosecution said Stewart had played "the long game" in order to inherit Ms Bailey's fortune, made from the publication of more than 20 books. He plied her with the sleeping drug zopiclone in the weeks leading up to her death, the jury heard. Stewart was told he would have to serve a minimum term of 34 years.